One of the world’s top travel destinations, the magnificent Milford Sound cannot be missed while journeying to New Zealand. Unofficially named the “Eighth Wonder of the World,” one would assume that it was an area full of beauty and sunshine, right? Wrong. Beauty? Yes. Sunshine? Not so much. 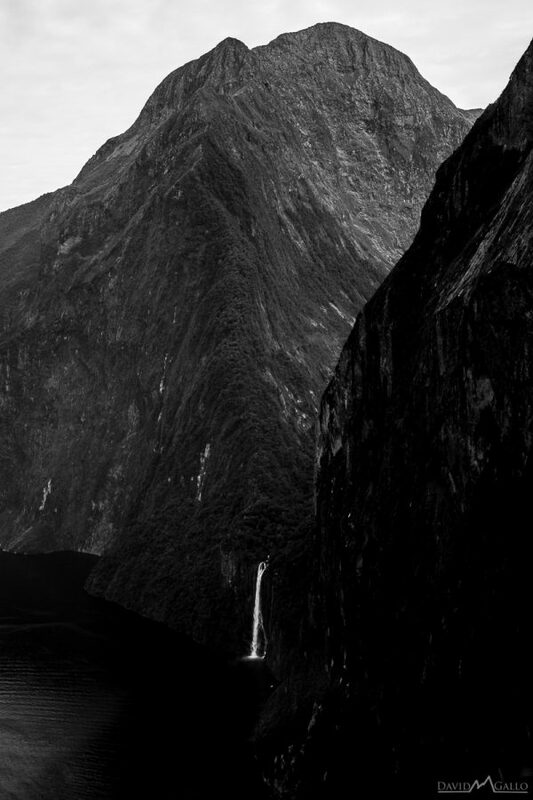 In fact, the Milford Sound receives about 7 meters of rain per year! Originally, we were just supposed to see Milford Sound by land and sea, and had succumbed to the fact that it would be pouring. 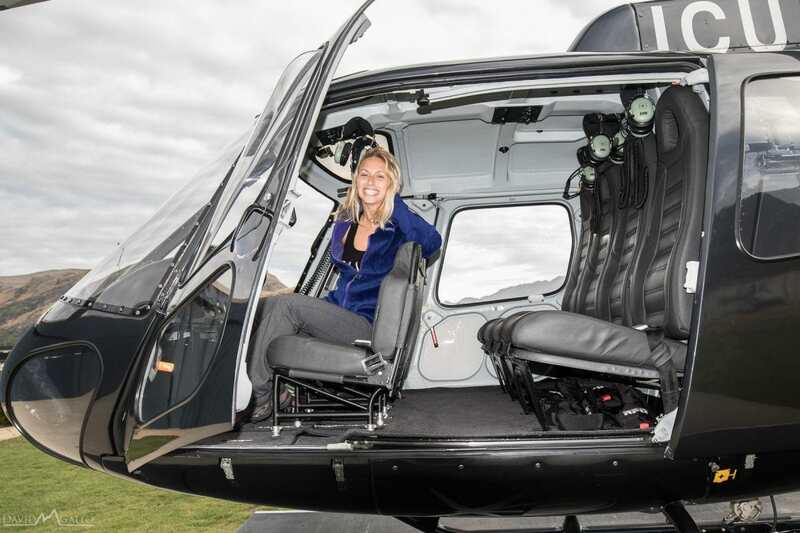 When we were in Queenstown, however, we decided to hop on a chopper with Over The Top Helicopters to go…over the top of the mountains and into Fiordland, specifically Milford Sound. 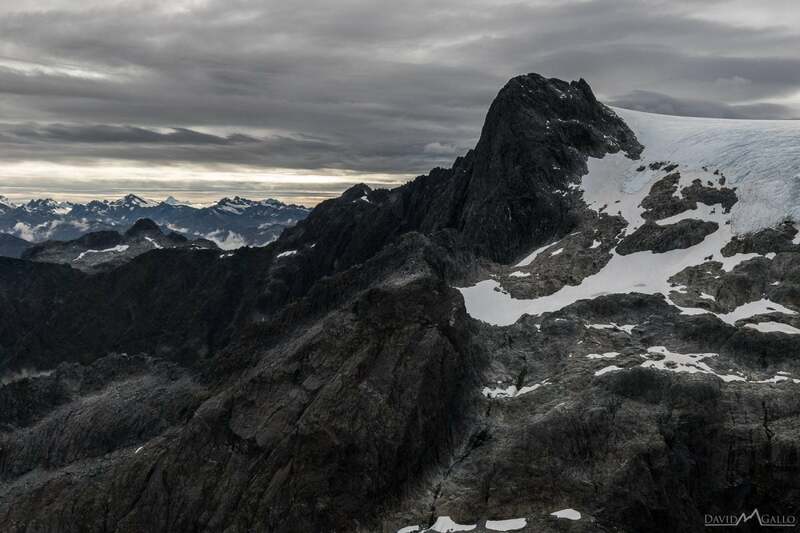 We weren’t sure if the weather would hold up, as weather in Queenstown could be vastly different on the other side of the mountain range in Milford Sound and we knew there was an impending storm. When we walked into Over The Top’s office in Queenstown and were given the green light for our hour and a half “Milford Sound and the Glaciers” flight, we were ecstatic. 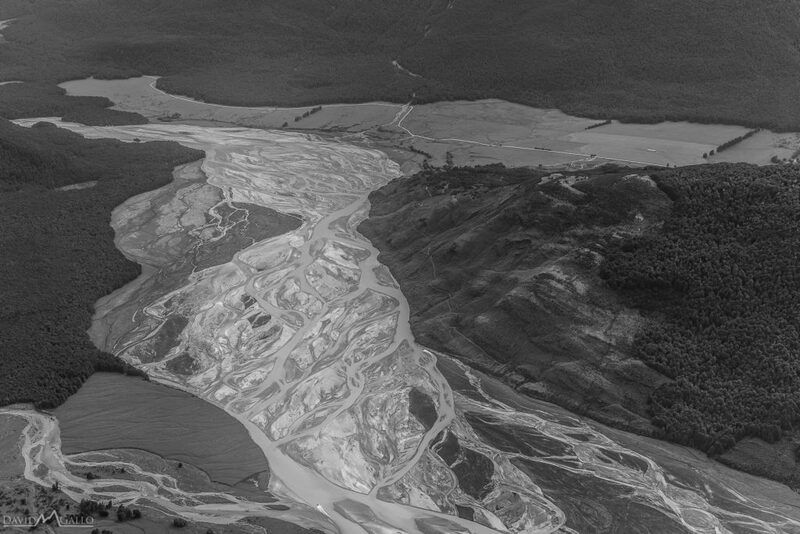 The heavy rainfall in the region does, however, make for incredible landscapes from lakes, rivers, and waterfalls to rain forests and glaciers. Before we knew it, we were running through the safety procedures and met our pilot James. After a brief introduction, he took us out to our helicopter: a Squirrel AS350 suited for five to six passengers. We opted for a Share With Others (SWO) flight, yet there was plenty of room inside the vessel! The Squirrel fits four people across the back bench, and two people up front next to the pilot. 5FT Tip: In order for two people to sit in the front seat, they have to have a combined weight of less than 154 kgs. Good things David and I only weight a combination of about 100 kgs! This particular helicopter offered beautiful 180 degree views — with windows not only in the front and on the sides, but on the roof and the floor as well. We could actually look down over our surroundings! We also loved that there was a tablet with a full flight plan and tracking, fully visible for all to see. The rugged beauty of New Zealand never ceases to amaze me, and this Milford Sound and Glaciers helicopter tour most definitely didn’t disappoint. First, we flew over Queenstown and the gorgeously blue Dart River. 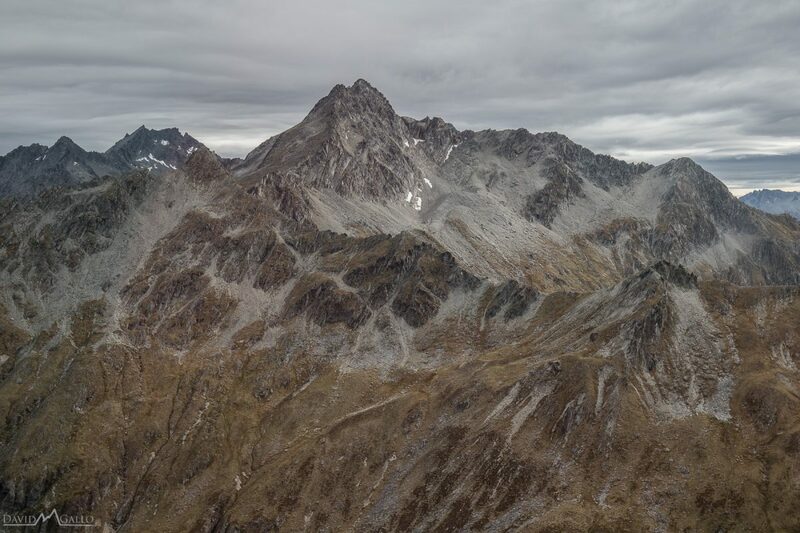 We continued to fly over the snowcapped mountains surrounding Queenstown, and then opening up into the vastness that is Milford Sound from above but jaw-dropping. 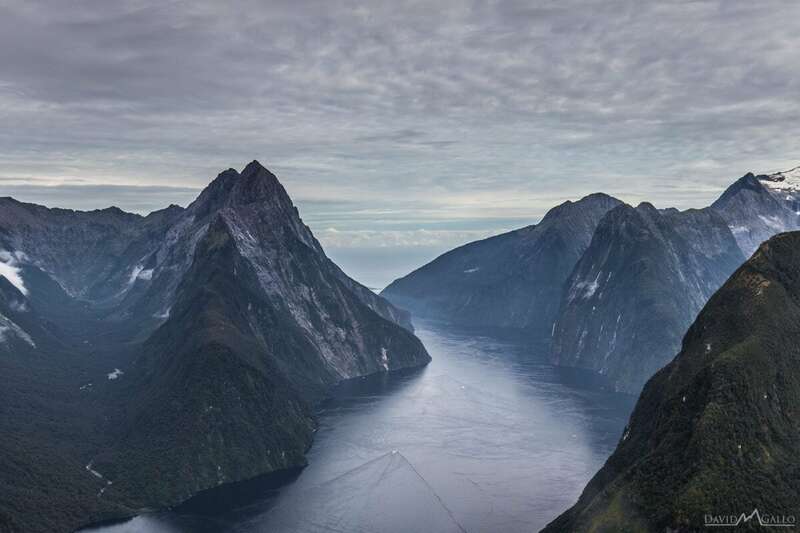 Over The Top provides you with the iconic view of Milford Sound that most people only dream they could see. David and I were shocked at the height of the peaks, as we’d always pictured Milford Sound as minor hills in comparison to New Zealand’s other mountains, but we were wrong. 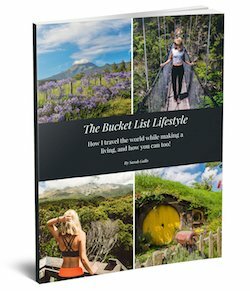 They are huge, powerful, and beautiful. From above, James pointed out Sutherland Falls, New Zealand’s highest waterfall only accessible via scenic helicopter flight or after four days of tramping along the Milford Track. He also showed us a massive waterfall that provides hydroelectricity for the Milford Sound township. A helicopter uses one liter of fuel every 20 seconds. Milford Sound has 182 days of rain a year. Milford Sound is only 40 nautical miles from Queenstown, but on average they get approximately 7-8 times more rain in a year. 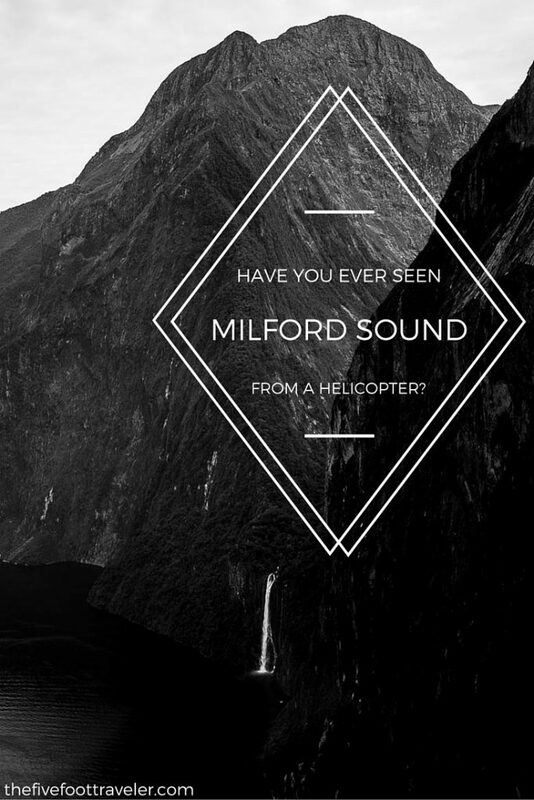 Milford Sound is actually a Fiord, but was named incorrectly as a Sound. 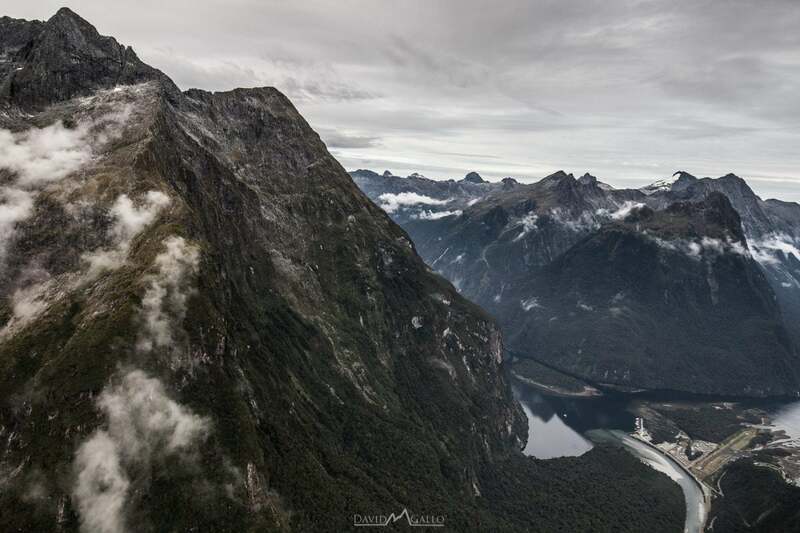 Rather than changing it to Milford Fiord, they named theentire national park Fiordland. There is no cell phone coverage in Milford Sound, and they have to generate their own electricity. They do this by using a large waterfall, “Lady Bowen Falls,” which powers a hydroelectric power plant. The waterfall is also where they get drinking water, and the household water supply. 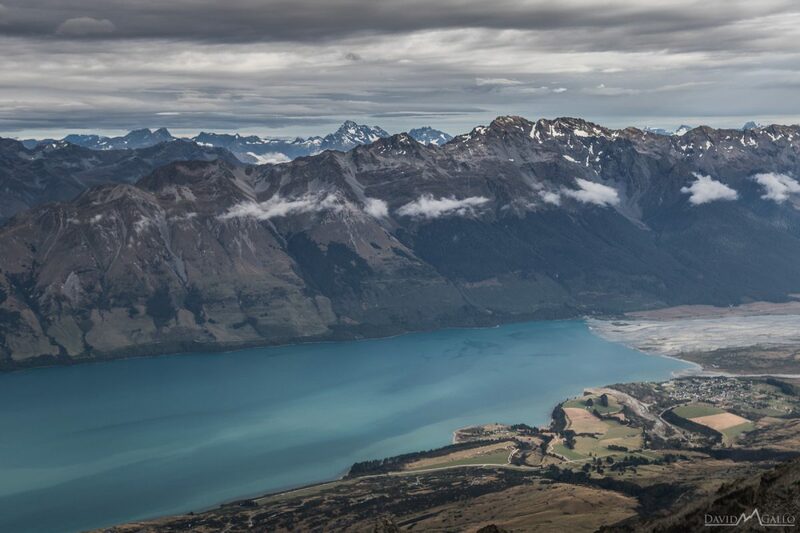 Over The Top operates a modern fleet of Airbus helicopters, and they are the only company in Queenstown to operate a twin engine helicopter. Over The Top has received International and National Helicopter Safety Awards for both company and individual pilots. Commitment to safety is most definitely important! 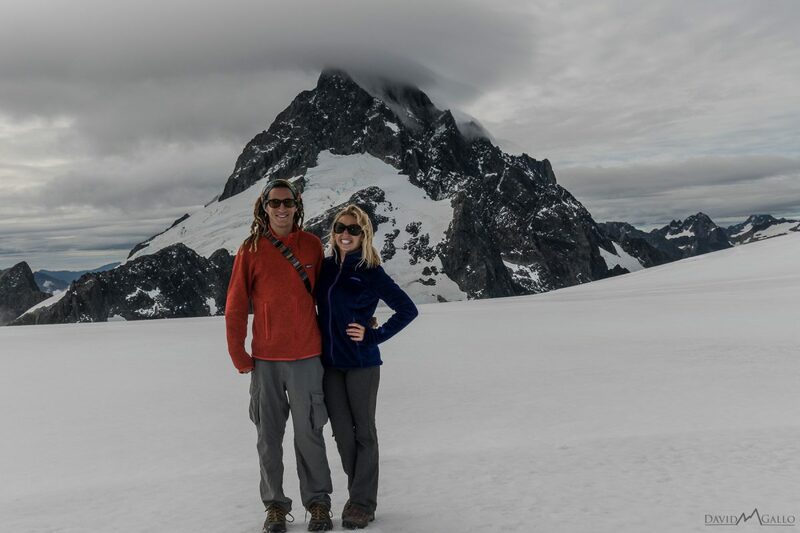 After taking in the spectacular Milford Sound, we flew back over the snowcapped mountains and glacial lakes to land on a glacier itself: Mount Tutoko. 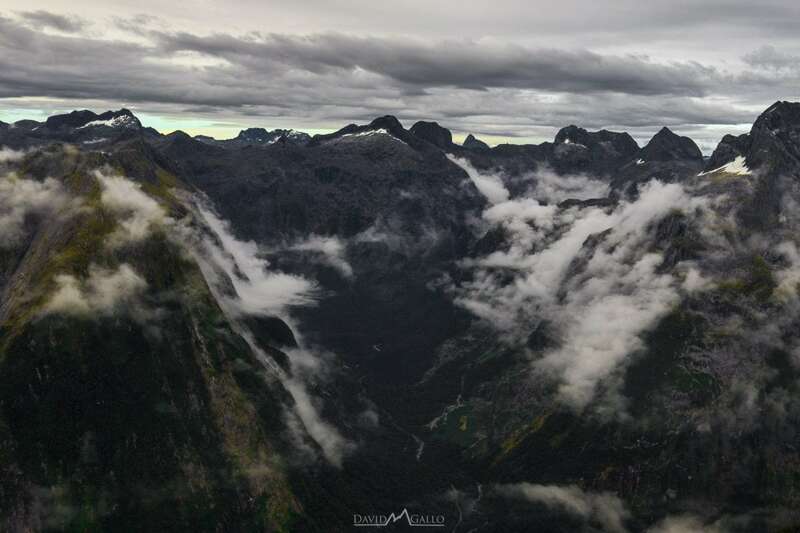 Mount Tutoko is the highest peak in Fiordland National Park, rising at about 9,000 feet. 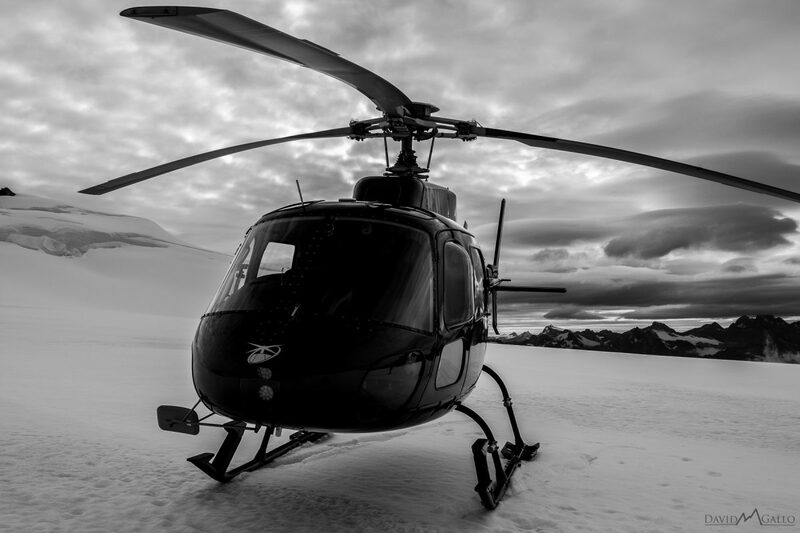 The company has a range of glaciers that it could land on, depending on weather, and Over The Top is the only company in Queenstown completely shuts down their helicopter while on a glacier in such a remote area. We decided how long to spend on the glacier. Despite it being freezing, the views were outrageous! To see the sun rising behind the mountains in the distance is a view I will never forget. Over The Top Helicopter Tours truly knows how to go “Over The Top!” James rattled off facts to us throughout our entire journey and pointed out little intricacies that we never could’ve spotted on our own. The precision of his piloting, and the views he provided us with, were absolutely spectacular. I know that helicopter flights are a bit pricey for some, but it’s worth every dime. **Special thanks to Over The Top and Air New Zealand for sponsoring our journey. As always, all opinions are my own. Photographs taken by David M Gallo Photography.